Yarn: STR lightweight (100% merino), colorway "My Blue Heaven." 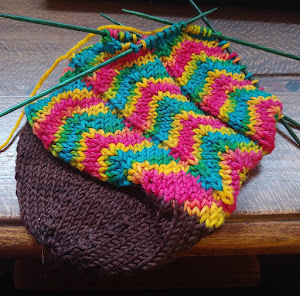 Pattern of my own devising, based on Sivia Harding's Queen of Beads socks. Otherwise, this very boring bit of stockinette is the beginning of a "Baby's First Tattoo" sweater. My cousin and his wife had a baby at the end of last month, and I'd been wanting to knit this for awhile. Now off to watch House and knit some more. The socks as pictured were gorgeous, but they were beaded. I'd started knitting the pattern as written (mostly) but was wondering if I would ever wear beaded socks. Then my friend B left a note on my Facebook page, saying she was thinking about fingerless mitts, "something like this sans finger bits." Cue lightbulb moment. I'd never knit with beads before, but I recommend it. It's fun! On the trial and error note, I couldn't make head or tail out of the cast-on for this pattern as written. I don't know if I'm just dim or what, but after three or four attempts at it, I gave up and used my usual method. Mitt two is on the needles, and I'm thinking of what to do next. So much knitting, so little time. And how lovely she is, no? Final dimensions were about 31 by 60 inches. 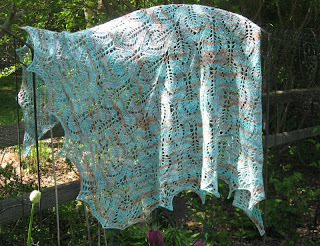 Pattern: Gail/Nightsongs by MaweLucky (Jane Araujo). I would classify it as intermediate--an easy pattern once you get the hang of it, but tricky to figure out at first. And here with the beautiful lilacs in my backyard--they're fading now, alas. As promised, long ago, here are some of my souvenirs from my spring break. This is Great Adirondack Yarn Company Silky Sock (70/20/10 merino/silk/nylon) in Hibiscus. These really aren't my usual colors, but I was very drawn to this skein regardless. I have to find the perfect pattern to showcase this yarn--I don't think it's quite suited for mindless socks. Any suggestions? 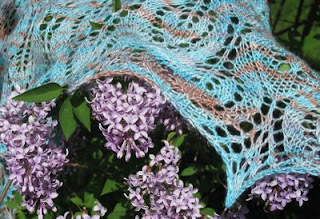 This is Artyarns Silk Rhapsody. I'm not sure of the exact fiber content--the website says 70/30 mohair/silk, the label on the skein says 50/50. Either way, it's beautiful stuff. Another shot, because it's too beautiful to resist. This and the Silky Sock above were purchased at Knit and Stitch = Bliss in Bethesda. Of the yarn stores we visited, this was far and away our favorite. The women working there were absolutely wonderful, and we met a great fellow knitter we must have talked to for a half an hour. I highly recommend it if you're in the area. This is Knitswithsticks Wullenstudio sock yarn (75/25 merino/nylon), in the delightfully named "Lipstick on Your Collar." Something for nice lacy socks, I think. If you can believe it, that's still not quite everything, but I think I'm done for now. Gotta go knit mitts . . . I haven't been knitting a whole lot lately--we had a very hot few days, which meant I didn't feel like sitting around with wool all over my lap. I've spent a lot of time working on this, my current cross-stitch project. I think it will be a wedding gift for a friend of mine. It's a huge piece, but the wedding date isn't even set, so I have plenty of time! What I have been knitting, though, is pretty awesome. 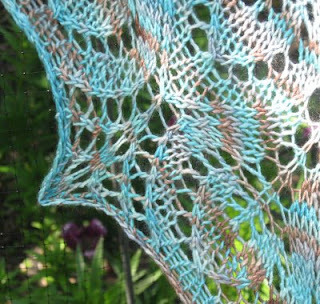 I'd stumbled across this pattern on Ravelry, and before I knew it, I was part of a knitalong and serving as a moderator for the community. It's been great fun. 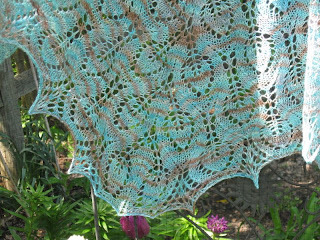 My shawl is almost done; then I have to think of something new to knit! Well, that's not quite true. 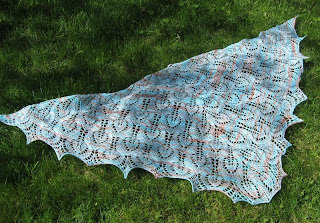 There's another shawl associated with the KAL . . . Here, it's off the needles due to an unfortunate misjudgment regarding how much yarn I had left. Fortunately, I have a lifeline in, and it was a good opportunity to get a look at it spread out. Oh, and I also finished the latest pair of mindless socks. Stripey. My lovely friend Nyx sent me this Silky Wool, and I haven't decided what to do with it. It's about 200 yards, sportweight, 45% wool/35% silk/20% nylon (color 47, "Griege"). There was controversy over the fiber content--the label on the yarn proper reads 65% wool/35% silk, but evidently KFI was called out for it, as their website now lists the correct content. It certainly has that slightly squeaky feel of acrylic (although we're not talking Red Heart here). I could combine it with the red and gray alpaca--they're almost exactly the same weight--but I'm reluctant to do so. For one thing, it would go well with either the red OR the gray, but not really both together, which would leave me with one lonely skein a-begging. For another, the difference in the fiber contents might feel odd in something made of such a fine yarn. What say you, blogosphere? What should this wool become? Introducing Sashimi, a very special shiba inu. I really don't care what you humans are up to. What's that funny-looking box in front of your face? *sigh* I suppose you can take my picture if you really want to.